What determines the path of marine debris through the ocean? Physics! A combination of characteristics of the object, and the patterns of wind and ocean currents all play a role in where marine debris moves in the ocean. Why do we care? With two types of information–where debris winds up (on a COASSTER’s beach, for instance) and the influences of the movement of debris–we can determine where the object may have come from. This process can help to determine the sources of what’s washing in on our shores. If we already know the source of marine debris and its beaching location, it can serve as a sort of “tracking device” or drifter. Following the devastating tsunami that struck Tohoku, Japan in 2011, models have been used to predict the path of the tons of debris that washed out to the ocean. The accuracy of these kinds of predictions depends on real, live information to verify and improve the methods. COASST’s new marine debris program will collect this kind of data, taking into account the very characteristics of debris that play a part in how the object may move through the water. So how does it work? Ocean currents are important no matter what, but the influence of wind depends on characteristics like size, hollowness, dimensionality (is it flat? ), and material (tells us about density). Obviously, hollow and less dense (buoyant) objects are likely to rest higher in the water than solid or heavy objects. The shape and volume of any hollow cavity influence how a floating object is affected by wind. The area of the object that sticks above the water, or “sail area” determines the degree that wind impacts the object’s movement. This is known as “windage”. High windage– where the majority of the object is above the surface of the water–results in an increase of wind force on the sail area, where wind patterns in addition to ocean currents play a role in the path. Just as it sounds, the sail area acts as a sail and catches the air current. Oppositely, the “drag area” is the part of the object that lies below the surface. For objects that are flat or float just below the surface, windage will be very low. You may have heard of the North Pacific Gyre (NPG): a slow-moving spiral of converging ocean currents created by a high-pressure system of air currents. 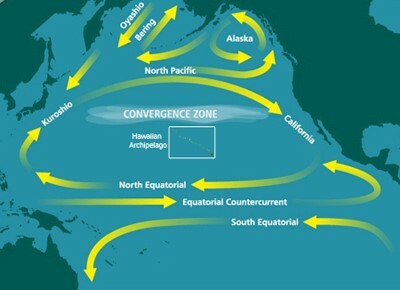 Within this convergence zone lies what is known as the Great Pacific Garbage Patch; millions of pounds of trash and plastic that extend for miles below and across the surface of the ocean. The massive accumulation of garbage comes from all over and is carried to the NPG by those very currents that converge there. Every piece of plastic that forms the “garbage island” got there by the forces of ocean and air currents. Objects with higher windage, tend not to accumulate in the Garbage Patch, as the wind sends them on their way. This entry was posted in Marine Debris, Uncategorized and tagged Marine Debris on 26. November 2014 by coasst.